For what is a relatively simple concept, the Stealth Rack is incredibly effective. The sleek appearance of the rack focuses attention on the kit while the modular design means you can invest in the bare minimum and use your existing stands with it. Easy to set up and break down. Can also be adapted as your kit/ style changes. Great looks, decent price. 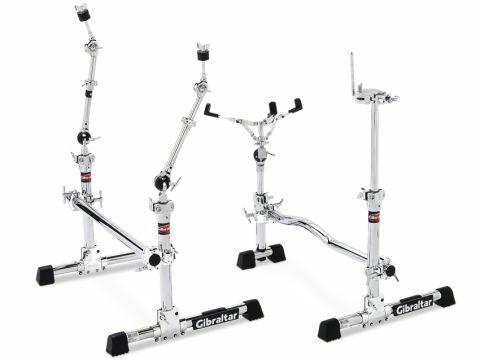 Gibraltar devised the Stealth Rack to provide an unobtrusive solution to drummers with an aversion to conventional racks, while also dispensing with the clutter of overlapping tripods familiar to anyone with a stand-based set-up. The design revolves around keeping the horizontal elements of the rack low and to the sides of the kit. This allows a clear view of the drums, which, at a time when finishes are ever more distinctive and decorative, can only be a welcome development. Stealth Racks are assembled using standard Gibraltar chrome-plated steel tubing. The tubes are fairly substantial but, being hollow, are pretty light. Where other manufacturers have opted for square or hexagonal rack tubing, Gibraltar is happy to stick with circular bars. We can't see how it can be suggested that circular tubing might be more likely to creep where clamped - have you ever seen scaffolding erected with anything other than circular bars? "The rack's design keeps the horizontal elements of the kit low and to the sides allowing a clear view of the drums"
There is a familiarity to round tubing as well, as it resembles cymbal stands and other existing hardware. 'Stealth' might conjure images of military vehicles with odd angles and matt black paint, but the rounded, polished tubing of the Stealth Rack blends in with the kit. The shininess of the bars only serves to reflect the already visible finish of the kit further. Where regular racks tend to span the front and sides of a kit, the Stealth Rack is split into two side-only sections. As well as saving space, this leaves the front of the kit free of horizontal bars, so contributing to the stealth factor. The two sides are not identical as they serve different purposes, but both are based around a pair of upright tubes fitted with feet that connect to a horizontal bar. These two assemblies are enough to complete your setup as Gibraltar has designed a modular system that allows rival manufacturers' hardware to be incorporated into the rack. On the snare side is the GSVMS, or Stealth Vertical Mounting System. This pairs one regularly-sized upright with a shortened upright that sits on a narrower foot. It is positioned with the horizontal tube running from the front of the bass drum right into your playing area. The end with the larger upright and foot is placed furthest away from you to receive a single or double tom arm. Nearest to you, the top of a snare stand can be planted into the smaller upright. The smaller foot is clearly designed to not intrude on your pedal action. Linking the two uprights is a bar with a gentle curve close to one end, intended to arc over a double bass pedal connecting rod. The vertical and horizontal bars are attached to one another with a pair of 90 degree clamps which are simple to fit and tighten. The Stealth Rack sent to us for review is a GSVMS-KIT, which includes all of the components from the GSVMS along with a Gibraltar snare basket and tom arm. The more basic GSVMS is supplied with three sets of plastic collars that clip into the locks at the top of the uprights. Their varying diameters cater for virtually every stand on the market, so you can save money by slotting your own stands into the fittings. On the other side of the kit sits the GSSMS, or Stealth Side Mount System. This is made up of two identical uprights joined by a straight horizontal bar. Both of the uprights will accept Gibraltar's own and other brands of stand as plastic collars are again included. Aside from the obvious places to locate stands, extra boom arms and mounting posts can be attached anywhere on the GSSMS. Clamping off the wider tubing sections requires a special Gibraltar clamp, but we managed to add additional stands using regular clamps on the narrower boom sections. These had the advantage of being higher up as well. As for the Ultra Adjust boom arms sent out with the rack - let us simply say that they're ingenious and worth checking out.